I'll never ever let you go..."
It's a truism that we could be criticised for not paying enough attention to the sweeter side of life. Yes there are very few desserts on this blog and it must be admitted that it is not really our area of greatest expertise. But let's try to rectify this omission and learn some easy and quick puddings together. Behind the scenes we have been busy developing a new line of desserts, largely it has to be admitted driven by the necessity of providing a sugary conclusion to our buffet, cocktail and dinner party menus and fortunately our shot glass desserts have become very popular. In line with our general ethos we endeavour to produce menu items which blend east and west with a twist or to coin a popular phrase "fusion"! 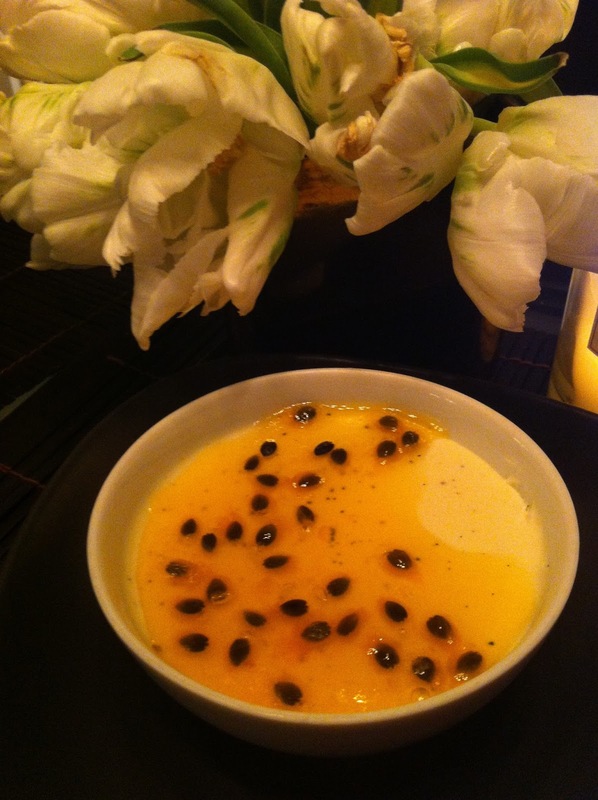 Here's a panna cotta dessert we developed recently and it has just made it's debut onto our party menu lists. Literally "cooked cream" it makes a wonderful foil for all sorts of accessories. Here it is shown with a passion fruit coulis but goes equally well with other fruit toppings such as cherry jam for example or chocolate sauce. To add texture try a biscuit crumble. 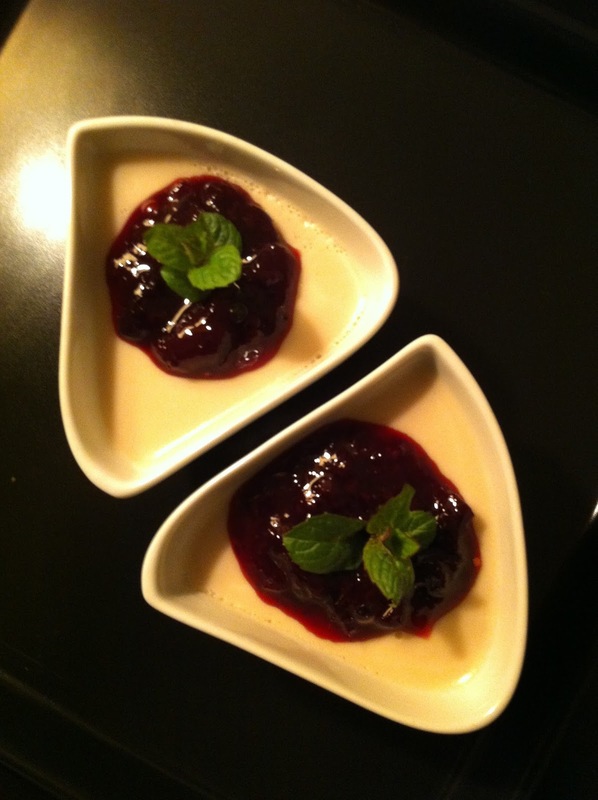 Panna cotta with a summer berry jam. Soak the gelatine in cold water for 5 - 10 minutes. Meanwhile combine coconut milk, double cream sugar and vanilla in saucepan. Squeeze gelatine and add to the pan. Simmer for 5 - 10 minutes in medium heat (Do not boil) Sieve liquid into serving dishes and allow to fall to room temperature before placing in the fridge for a few hours or preferably overnight. Scoop out middle of passion fruit and add sugar and lime juice and simmer for a few minutes until sugar is dissolved and liquid has become syrupy. Before serving pour coulis over panna cotta and garnish with tropical fruit.